Antone’s affable style and enthusiasm for the subject matter easily won over students of the 12-week guest spot in Dr. Lester Kurtz’s course, “Blues, Race and Social Change” (SOC 308). This is a series of lectures was recorded and resides both in the collection of the Fine Arts Library and online at the university’s digital repository, Texas ScholarWorks. Handwritten note from President Johnson to the Pugwash Conference regarding the avoidance of nuclear war. The Prague Spring Archive project — a collaboration between the University of Texas at Austin, the Center for Russian, East European, and Eurasian Studies (CREEES), and the Lyndon B. Johnson Presidential Library — has been made live at http://scalar.usc.edu/works/prague-spring-archive. The project aims to make important primary documents on the Prague Spring openly accessible to a wide and inclusive audience, connecting the University of Texas at Austin with an international community of scholars and researchers. The project began in 2014, when CREEES Director and Slavic Department Chair Dr. Mary Neuburger met with Assistant Director of Research and South Asian Studies Liaison Librarian Mary Rader to discuss an effort to broaden opportunities to access historical primary resources located in the LBJ Presidential Library’s archives. In 2015, with funding from a US Department of Education Title VI National Resource Centers grant and the Texas Chair in Czech Studies, digitization work on an initial selection of archival boxes was completed by undergraduate and graduate students from CREEES and the UT Libraries. Digitization work is ongoing, with new materials being photographed, processed, and added to Texas ScholarWorks by graduate student Nicole Marino and Russian, East European, & Eurasian Studies and Digital Scholarship Librarian Ian Goodale. The Prague Spring was one of the key events in both the Cold War and 20th Century Czech history. 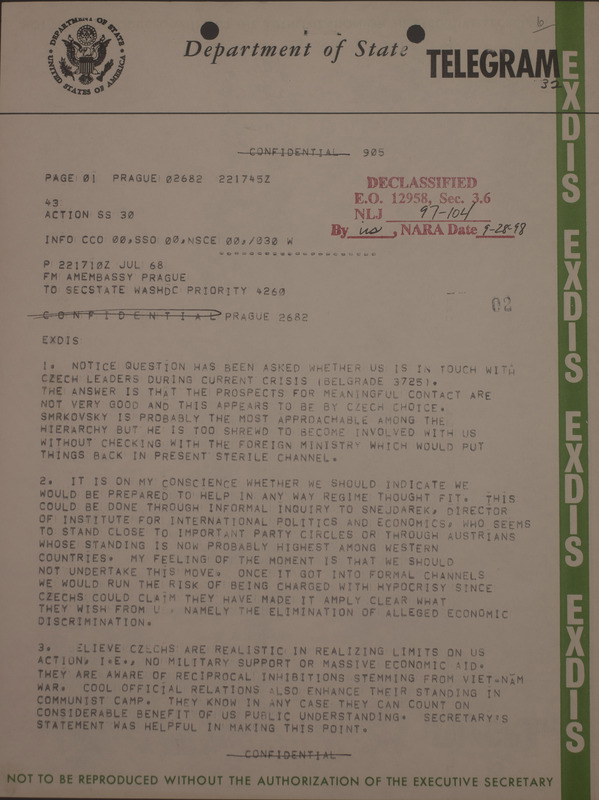 The LBJ’s collections chronicle the United States’ perspective of events leading up to, during, and following the USSR’s invasion of Czechoslovakia, including declassified cables, intelligence reports, letters, and memoranda exchanged by ambassadors, diplomats, intelligence officers, and politicians. Eight archival boxes are currently available digitally through Texas ScholarWorks, with more being worked on and prepared for addition to the repository. Many additional materials that have not yet been digitized are available to researchers in the reading room of the LBJ Presidential Library, as well. The Prague Spring Archive portal has been designed to replicate the original archival structure of the physical materials in the LBJ Library within a digital framework, allowing the user to “read” and explore the archive on their computer. The portal was designed to appeal to both academic researchers and to patrons conducting personal or non-academic research, with additional features planned that will extend the breadth of the site’s audience. A primer on the Prague Spring in the form of an interactive timeline is one of the site’s features aimed at users not already thoroughly familiar with the events surrounding the incident. A module that will include materials aimed at high school teachers and students, including sample lesson plans and educational activities, will also be added in the future. For researchers who would like to explore what is available in the physical collections of the LBJ, the finding aid for the entire archival collection is also available on the site. To help maintain the archival integrity of the materials in their digitized format, extensive metadata was created to accompany the materials within the Texas ScholarWorks repository. The metadata allows the materials to be easily searched by researchers working with the materials within ScholarWorks, and can be downloaded by anyone through the repository. Full-text of the documents will soon be added in XML format to accompany the archival PDFs, increasing searchability and providing an additional resource for working with the documents—making digital humanities practices such as text mining or sentiment analysis easier to accomplish, for example. Cable Regarding United States Place in Czech Crisis. The Prague Spring site has been an important aspect of embedded librarianship at the UT Libraries. Ian Goodale worked with graduate students in Mary Neuburger’s graduate seminar, REE 301: Introduction to Russian and East European Civilizations, to have the students contribute text for incorporation into the online portal. The students also selected key documents from archival folders to be highlighted on the portal and provided input on the site’s design and features throughout its development. Professors Mary Neuburger and Vlad Beronja contributed their input on design and content, helping to write descriptions of archival materials and select key documents to profile. The finished portal was then presented to the class for additional feedback, and more of their content will be added shortly. The Prague Spring Archive portal is an attractive, easy to navigate resource that will continue to grow over time. New content and features, in development, will expand its scope and elevate its impact. Utilizing digital humanities tools and collaborative approaches to leveraging local expertise, the project creates context for important, unique primary source materials and shares them in an open access environment for use by local, national and international scholarly communities.